On a cloudy and mildly threatening first day of May in 1851, Queen Victoria arrived at the Great Exhibition to a tumultuous welcome. Attired in a dress of pink watered silk, brocaded with silver and decorated with pink and blonde ribbons ornamented with diamonds, she wore a head dress of diamonds and feathers and on her arm, the Order of the Garter. Her entrance to the building was marked with a flourish of trumpets while those in the audience waved hats and handkerchiefs. In the words of The Times, the "whole scene presented was one of unusual splendour." "observed with a warm and increasing interest the progress of your proceedings in the execution of the duties intrusted to you by the Royal Commission." She went on, not surprisingly, to express her "sincere gratification to witness the successful result of your judicious and unremitting exertions in the splended spectacle by which I am this day surrounded." Butr what else could the Queen say? This was the great triumph of her beloved Albert's efforts. it was new, it was exciting. Writing to her uncle Leopold, King of the Belgians, on 3 May, she described her feelings and emotions. It was, she told him, the "greatest day in our history, the most beautiful and imposing and touching spectacle ever seen and the triumph of my beloved Albert." It was, she goes on to say, "the happiest, proudest day in my life." Despite waxing ecstatic over Albert's contribution, she managed a few snide digs at his detractors. Albert's dearest name is immortalised with this great conception, his own, and my own dear country showed she was worthy of it. The triumph is immense, for up to the last hour the difficulties, the opposition, and the ill-natured attempts to annoy and frighten, of a certain set of fashionables and Protectionists, were immense; but Albert's temper, patience, firmness, and energy surmounted all, and the feeeling is universal. You will be astounded at this great work when you see it! The beauty of the building and the vastness of it all, I can never thank God enough. I feel so happy, so proud. In the six months that the Great Exhibition ran, Victoria visited it frequently. But so too did many of the great and fashionable. Charlotte Bronte visited it five times. 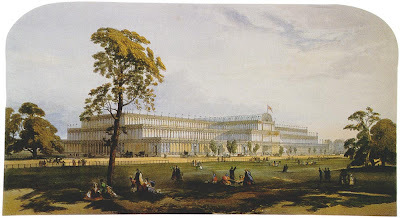 Writing to her father on 30 May, she described her attendance at a lecture by Thackery and then went on to describe her first impressions of the Exhibition, and particularly the "look" of the Crystal Palace. The exterior has a strange and elegant but somewhat unsubstantial effect. The interior is like a mighty Vanity Fair. The brightest colours blaze on all sides; and were of all kinds, from diamonds to spinning jennies and printing presses, are there to be seen. It was very fine, gorgeous, animated, bewildering. Nonetheless, she went on to tell her father that she "liked Thackeray's lecture better." But as time wore on and visit followed visit, she became more enamoured of the Great Exhibition. In a later letter, Charlotte wrote to her father, "I must say I was more struck with it on this occasion than at my first visit. It is a wonderful place - vast, strange, new and impossible to describe. ...It may be called a bazaar or a fair, but it is such a bazaar or fair as Eastern genii might have created." Not everyone was enthralled with the amazing glass structure. Pugin called it "a glass monster" and advised Paxton to limit his building to greenhouses. Ruskin complained that its contents were trivial and Thomas Carlyle compared it to a "big glass soap bubble." During the 141 days that the Exhibition was open to the public, it played host to six million visitors. Once it ended, London would never be the same again. Consider, for example, one small businessman in Knightsbridge, not far from the site of the Crystal Palace. A wholesale grocer from Stepney took over a small shop hoping to cash in on the Great Exhibition. And "cash in" he did. Charles Harrod built his shop into a thriving retail business which by 1880 had over 100 employees. Another fortune was made by Schweppes which sold 85,000 dozen bottles of soda water, almost one-half of its sales for the year, at the Great Exhibition. This was in addition to the half-ton of tea and six tons of coffee they provided to service two refreshment courts (such as the one on the left) for which they were suppliers. 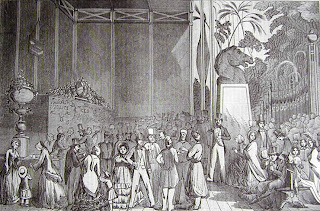 Of those who visited the Great Exhibition, the great majority were British and had come from every place in the British Isles to view the Crystal Palace. For many, it was the first time they had come to London and the cost, both in money and time was to make it a once-in-a-lifetime experience. Special trains brought visitors from all over the country. Thomas Cook ran tours from Yorkshire and the Midlands and in the the short period of the Exhibition he carried more than 150,000 excursionists to London and back. Indeed, so significant was the business that he even promoted his tours with a newspaper, Cook's Exhibition Herald and Excursion Advertiser. 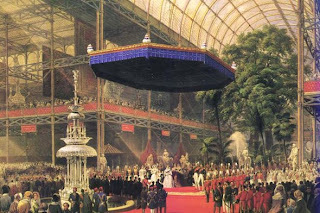 it was a unique and fascinating experience for the visitors to see the wonders of the world gathered in the great glass and iron building which seemed so to dominate Hyde Park. But if what was inside the building fascinated, it was the structure itself that captured the imagination. Not only was it one of the most incredible construction projects ever undertaken, it required the development of new methods of construction and it contributed to, if it did not create, the process of mass production of interchangeable parts. 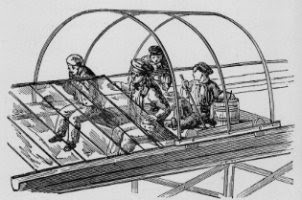 Just one example of the new technology that was required can be seen on the left, a sled pulled along the guttering in order to expedite the insertion of the glass panes into the building. The building was never meant to be more than a temporary structure, yet it became one of the architectural wonders of the nineteenth century; an example of what could be done with iron and glass and imagination. Despite the litany of complaints as the building was being erected, mostly from those who believed they should be profiting from it, the one criticism which can, fairly, be laid at the building’s feet was its lack of cohesion. Inside, the wonderful straight lines which captured the eye and drew it onward and upward were compromised by busy, rounded art works totally out of place; not to mention out of time. While the era demonstrated progress in power, architecture and construction in the sciences, the arts languished. there was too much of too little and that "little" was all too often the fancy doo-dads so popular in the age of ornamentation. It was as if anybody who thought they had something to exhibit could show it at the Great Exhibition. John Lienhard, of the University of Houston summed it up. The power of the exhibition lay in the engineering of the building. Victorian art and design lumbered on, ponderous, off-the-wall, and slightly claustrophobic. It was Victorian engineering that laqy its hold on our imaginations. The simple truth was that engineering was the major art of the middle 19th century. The Crystal Palace itself, not its contents, was the art here. In the end, the Great Exhibition ended more with a whimper than a bang. For almost a year after the Exhibition closed, the building remained with nobody quite sure what should be done with it. It had, after all, been meant as a temporary structure. It had served its purpose and now it was time for it to go - or so Prince Albert thought. Finally, on 29 April 1852, the House of Commons agreed. The building had to be torn down or removed. In just over a fortnight a company was formed and the public was invited to subscribe to a plan to move the great building to Sydenham Hill in Norwood, just south of London. In what must have been one of the most monumental moves of all time, the building was taken down glass pane by glass pane, column by column, and moved by horse and dray to its new location. 400 tons of glass and 4,000 tons of iron were dragged up the hill by horse and cart. A 15 ton, 50 year old palm tree was purchased along with an enormous amount of greenery to go into the reconstructed building and the three-storey tall palm tree was dragged up Sydenham Hill on a special wide-wheeled transporter pulled by 32 horses. And so it stood, the new Crystal Palace, larger than the one in Hyde Park. It was to remain an outstanding landmark until 1936 when it burned down. To view or download The Industry of Nations as Exemplified in The Great Exhibition of 1851, click here. On 14 April 1887, the steamship, State of Nebraska entered the Thames and anchored at Gravesend fourteen days after leaving the United States. Despite a rousing send-off with, according to Colonel William F. (Buffalo Bill) Cody, thousands there to see the travellers away, the voyage was not easy, with headwinds for much of the trip. 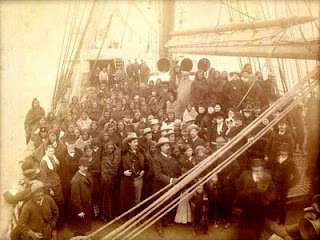 But what made this trip unusual was its passengers including nearly 100 native Americans (See image on right). The weather was cold when they arrived in England, there had been snow earlier in the day, and the Indians wrapped themselves in their blankets to greet officials from the American Exhibition. The newspapers were enthralled with the arrivals who made up a part of "Buffalo Bill's Wild West Show," describing them as "the selected representatives of several nations, including the Sioux, the Cheyennes, and the Pawnees." The chiefs were "reserved and dignified," while the men were "of the highest type of physical humanity, and apparently possess[ed]all the traditional calm associated with the Indian character." Indeed, the "Noble Savage" had come to London which was about to be taken by storm. But the most popular person in the show was Colonel William F Cody, Buffalo Bill, himself (Seen on the left). Its great object is to illustrate the wild life of the Western frontier--its Indians and cowboys, its buffalo-huntings and cattle-ranches, its pioneering and its horsemanship, its dangers and its joys. The next day, on the 28th of April, William Ewart Gladstone and his wife came to the American Exhibition grounds to see the progress being made and especially to visit the Indian campsite. Although it was supposed to be an informal visit, word had been circulated and the workmen on the site received them warmly, while the band of the Wild West Show played, Yankee Doodle. Gladstone was introduced to one of the Indians, Red Shirt, whom he asked "if he liked the English climate." Red Shirt apparently replied with considerable forbearance considering the short time he had been in the country, that "he had hardly had sufficient experience to be able to say." Gladstone then went on to ask Red Shirt if he "thought there was that cordial relationship between the two great sections of the English-speaking race--the people of England and of the United States--that there ought to be between two nations that were so much akin." One can only imagine Red Shirt's thoughts when he replied that he "did not know much about that." It is not difficult to see why Queen Victoria complained that Gladstone always addressed her "as if ... [she] were a public meeting." But the Wild West Show was only one part of the Exhibition. In addition to Buffalo Bill and his show there were displays of American products and American ingenuity. It was to be an "attractive and instructive exhibition," but despite the reports in the paper it was clear the the central attraction was going to be Buffalo Bill's Wild West Show scheduled to officially open on 9 May. On the 5th of that month, the Prince and Princess of Wales with a party which included members of the Royal Household and a number of other members of the nobility including the Crown Prince of Denmark were treated to a private showing which included the first complete performance of the show on English soil. The guests watched from the Royal Box, duly draped with the English and the American flags. Colonel Cody's throwing of the lasso and shooting at glass balls thrown in the air by an attendant riding by his side, both horses going at full gallop. ... Buck Taylor, king of the cow boys[sic], picked his handkerchief from the ground while riding at full gallop, and also in the same way picked up a rope attached to a runaway horse. the Indians, yelling like fiends, galloped out from their ambuscades and swept around the enclosure like a whirlwind. The effect was instantaneous and otherwise electric. The Prince rose from his seat and leaned eagerly over the front of the box and the entire party seemed thrilled effectually by the spectacle. The Prince of Wales was particularly impressed by the shooting of the two young women, Annie Oakley and Lilian Smith congratulating them on their skills. 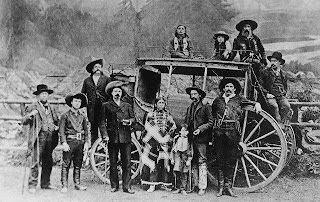 But the high point of the performance was the series of attacks by Indians on a wagon train, a stage coach and a settler's hut and the "gallant rescue in each case by a company of scouts under the command of Buffalo Bill." At the end of the performance, the Royal Party was given a conducted tour of the campsite. The grounds of the exhibition were also an attraction to thousands, the toboggan-slide and the switch railway being extremely popular as long as light lasted. At nightfall the grounds were illuminated in every part with innumerable coloured lamps and Chinese lanterns, while Mr. Dan Godfrey's band provided the necessary music. was altogether too big a thing to take to Windsor Castle, and as in the case of Mahomet and the mountain, as the Wild West could not go to the Queen it became absolutely necessary for the Queen to go to the Wild West, if she desired to see it, and it was evident that she did. The show went according to plan although there was one remarkable event. As the American flag went past the Royal Box, carried by one of the horsemen from the show, "her Majesty arose, bowed deeply and impressively to the banner, and the entire court party came up standing, the noblemen uncovered, the ladies bowed and the soldiers, generals and all, saluted." Needless to say, the Americans were overjoyed. The continuing large numbers at the show were indicative of the good press it received and probably the fact of the Queen's attendance. After the performance, Buffalo Bill was presented to the Queen who, according to The Times of 12 May "expressed herself as greatly pleased" and went on to tell him that "she only regretted that her time was so limited and she would like to come again." Not everyone was as enthusiastic about the Wild West Show as Queen Victoria. While the behaviour of most of the troupe was exemplary, there were, of course, exceptions. Late in July, Jack Ross, a member of the show, was charged at the Thames Police Court with being drunk and wilfully breaking a plate glass window at the Old House Revived public house. A few days later, in early August, Richard Johnson, billed as "The Giant Cowboy" at the Wild West Show, was charged with assault, including that of two police constables, one of whom had to be hospitalized. A more serious complaint was laid about the same time by an artist living near Earls Court. He sought an injunction restraining the defendants (the Wild West Show) "from causing a nuisance of noise and smell." He argued that the shouting of the performers and the roars of the crowd, including the sound of the brass band was excessive and the smell, particularly in the hot weather, of the horses and buffaloes was overwhelming. Affidavits and counter-affidavits were offered, and it was argued that the noise could not possibly be any worse than that caused by "the no less than 476 trains [that] daily passed within 50 yards of the plaintiff's house." the defendant proposed to publish with the words pictures, being exact copies of the plaintiff's pictures, the same expression of horror on the driver's face, and the real Buffalo Bill, in a blue shirt, riding up to the rescue of the mail. Sanger was warned that to publish the pictures would put him at serious risk, although "His Lordship considered the programme, standing alone, as unobjectionable, and discharged the order and directed Mr. Sanger to pay the costs of the application." 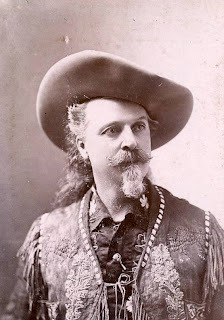 In October, Sanger agreed to a perpetual injunction keeping him from using the words "Buffalo Bill" and "Wild West," but that was in the same month that Cody's great show was closing. It had played to a total audience of over 1,000,000 people and its popularity was so great that it was to return in 1892 and in 1903/04 to once again thrill British spectators. To download and read Buffalo Bill's autobiography, click here.